Uber, the global ridesharing giant set to follow Lyft on a Wall Street listing, wants to offer a range of travel options to be the "Amazon of transportation"
Uber laid out its vision of a transformed world of personal mobility as it steered toward a keenly anticipated stock market debut that will follow an initial public offering of shares by US rideshare rival Lyft announced on Friday. "Cars really were, for us, a kind of starting place," said transportation policy and research chief Andrew Salzberg at an Uber media event in Santa Monica, California. "Once we've built this platform for mobility there are a whole host of business lines we can build beyond that." 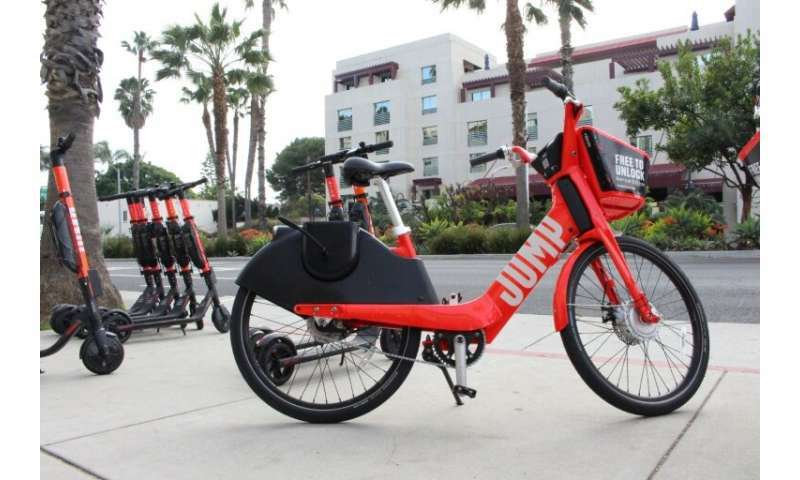 "The idea that every time you walk outside there is this electric, fun-to-ride vehicle waiting to take you to your next destination is really incredible," said Nick Foley, head of product for Jump, the electric bike startup acquired by Uber. "It's more than just an app to book a bike; it's an app where you can have reliable micro mobility booking or a could book a car if the weather isn't nice." Electric bicycles and scooters can get people efficiently to destinations in congested downtowns, where they can switch to public transit or car ride sharing at their convenience. Uber's effort to be an all-encompassing platform for getting around includes adding e-scooter rival Lime and city transit services to its smartphone application, along with improving features designed to get people to travel together instead of riding solo. The California-based startup's collaboration with cities includes sharing anonymous traffic flow data with officials in charge of public transit, bicycle lanes, parking and road planning. Uber is also integrating transit schedules into its app, and will soon add a way to pay fares as well. "We can't really be the Amazon for transportation without the biggest mode of transportation out there, which is public transport," said Uber transit team leader David Reich. "The vision is to be an all-in-one app for all your transportation needs." Jump has leapt into 16 US cities, and planned to expand internationally this year beginning in Europe, according to founder and chief executive Ryan Rzepecki. "I think we are in year zero of a 10-year, mega-cultural shift," Rzepecki said. E-scooters and dockless bikes arriving on streets of US cities have caused complaints, safety concerns, and the need for laws to reign in reckless riding. "For as much cultural change we have been seeing in cities, I think the pushback has been incredibly low," Rzepecki said, however. He was excited to get Jump into Europe, where he felt cities were more inclined to be designed with bicycling in mind. 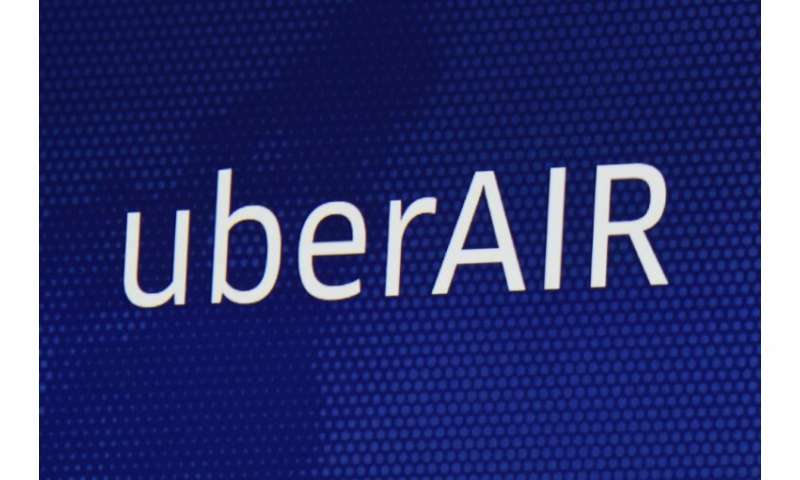 Uber is also taking to the sky with an Elevate project to have electric aircraft carry people between "skyports," taking off and landing vertically. Director of vehicle systems engineering Mark Moore, who spent decades at NASA, joined Uber a little more than two years ago. 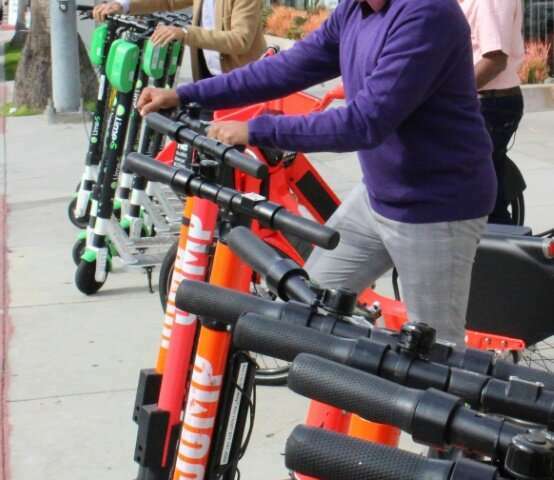 Dockless electric scooters such as those seen in Santa Monica, California, are part of Uber's vision to the "Amazon of transportation"
"We are one of the very big, bold bets that is coming up with a whole new choice of transportation in cities faced with gridlock really grinding them to a halt," Moore said of Elevate. He expected experimental flights next year, with Uber putting Elevate aircraft into service in Dallas, Los Angeles, and a soon-to-be revealed third US city by 2023, pledging to make this an affordable travel option. "We have zero interest in doing this for the elites," Moore said. "This is all about designing a nodal transport system that meets the needs of cities." Uber's platform moves cargo as well as people, with a "Freight" service that connects truckers with shippers in a way similar to how drivers connect with people seeking rides. Uber is also seeing growing success with an "Eats" service that lets drivers make money delivering meals ordered from restaurants. 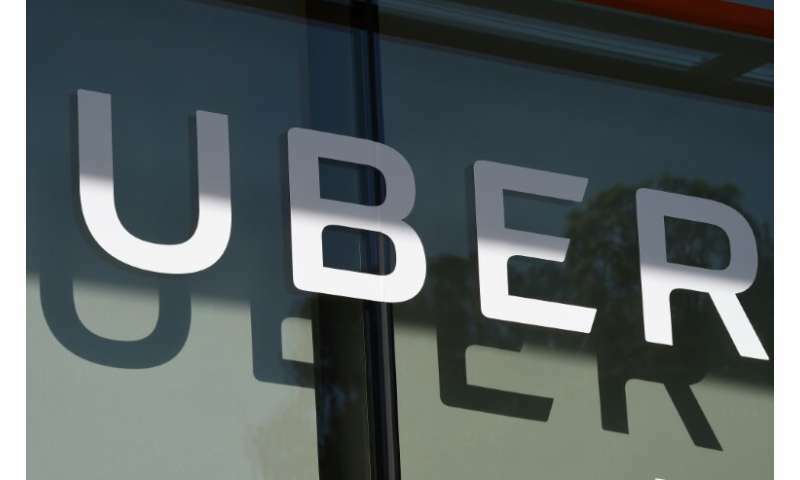 Uber is the largest and most prominent of the "sharing economy" startups that are on the cusp of transforming several industries, and its IPO could be a milestone for the trend. "When Uber goes public it will be a vote of confidence on the sharing economy but also a vote confidence on the company," said New York University professor Arun Sundararajan. Uber and public transit—friends or foes?